That's why Lions Clubs International started the Lions Recycle for Sight program. Everyone can help. View a video on how eyeglasses are recycled. 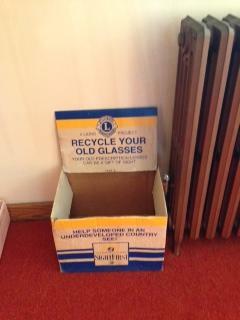 Eyeglasses are collected at our box located at Zion Lehigh Lutheran Church 8269 Spring Creek Road, Alburtis. Glasses can be dropped off while church is open for Sunday Services (8-11 Sunday mornings) or alternative arrangements can be made. Our drop box is located inside the main door, turn left in the foyer and it is located in the narthex before entering the sancuary.